According to some reviewers, the Nike LeBron 16’s rubber outsole is super hard and quite thick. They assert that these basketball shoes are OK to use outdoors. The cushioning feels super nice, nearly all testers declare. It provides a well-balanced ride that all types of players will enjoy. These LeBron James basketball shoes feel amazing on foot, many wearers exclaim. Almost all reviewers are impressed at the Battleknit 2.0. It’s the way Flyknit should be - soft, flexible, strong, and supportive. Several reviewers are happy that these LeBron basketball shoes are easy to put on. A few testers note that the LeBron 16 fits like the LeBron 15. Most owners report that these Nike LeBron shoes are straight up fire. They are claiming that it is one of the best looking LeBrons to date. These LeBron James shoes are more stable than the previous version, most players note. Nearly all testers agree that the Nike LeBron 16 has beastly traction. They say that it holds up really well despite the court condition. Most reviewers are satisfied with the overall support, stability, lockdown, and containment the LeBron 16 provides. The cushioning starts off a little stiff, some observe. According to a good number of testers, the thick cushioning provides minimal court feel. A few owners claim that these shoes feel heavy and bulky. Several testers are saying that the LeBron 16 provides a sloppy fit. They highly recommend trying these Nike basketball shoes in-store. These LeBron shoes are very difficult to relace, many testers gripe. The Nike LeBron 16 is quite expensive, some commenters remark. Overall, the LeBron 16 is a way better on-court performer than its predecessor and may just be one of the best basketball shoes of 2018. All the improvements Nike implemented made a world of difference. These LeBron shoes have beastly traction that holds up really well, a balanced cushioning setup that guards to bigs will enjoy, and finally, a strong and supportive upper that is also soft and flexible where it needs to be. The only real drawback is its $185 price point. Other than that, there is no other reason for not copping a pair. I also feel that this is a huge upgrade from last year's model. I know that the changes are not significant, but the small changes that they did make actually made the performance significantly better and the shoe overall more stable. Now granted, I still am a little salty about that sloppy fit but pretty much everything elso on the LeBron 16 was absolutely spot-on. Nike killed it with this one. That traction was locking me down no matter what court I played on. This cushioning setup was super fun to play in. And again, that Battleknit was extremely comfortable. I can say Nike fixed most of the issues found in the 15, and the 15 was an almost-great shoe. In the LeBron 16 we get better traction, a more stable midsole, more responsive cushioning, and a more contained upper that are all built for a King. Although I prefer a lower ride height, this is the best all around Lebron to come out in years. Great traction, cushioning, fit, stability and containment make this a great shoe for most players. Great performer all around with no major weaknesses which sounds a lot like the shoe’s namesake. Finally a Nike sig shoe done right. After 15 seasons, LeBron James is still unstoppable and remains the king of the NBA. His natural athletic ability, relentless work ethic, and ability to lead set him apart from the rest of the league. These Nike basketball shoes deliver unrivaled impact absorption and instant responsiveness with the combination of the Max Air and Zoom Air cushioning platforms. This innovative cushioning system helps absorb impact and then bounces it back for explosive energy return. Traction. These LeBron James basketball shoes have an articulated rubber outsole for flexibility. The outsole is lined with a modified herringbone traction pattern for superior grip on the hardwood. Length and Width. According to most wearers, the Nike LeBron 16 fits like the LeBron 15. Wide-footers are advised to go true to size. Normal and narrow footers can go down half a size. However, it is still best to try the shoes in store to get the proper fit. Lockdown. These LeBron basketball shoes boast an innovative gusseted tongue for a customizable fit. Flywire cables and extra lace feeds deliver locked-in support. Other support features include a padded heel collar, internal Achilles pillows, and an external heel counter. Battleknit 2.0 is designed to contain LeBron’s lateral force on the court. The knit upper delivers lightweight yet ultra strong support precisely where it is needed. “Our knit innovation team has this new technology, called a Shima machine,” Petrie explains. “It’s a brand new machine that allowed you to make a knit in a new way. It allows you to combine the structure of a woven, a really strong, in-all-directions type of construction, and then you knit through it and around it. The ‘1 Thru 5’ or ‘What The’ colorway combines the first five colorways of the Nike LeBron 16. Details from the ‘Fresh Bred,’ ‘20-20,’ ‘Strive for Greatness,’ ‘I Promise,’ and ‘King’ colorways are all incorporated in the shoe’s design. These LeBron James basketball shoes boast a dazzling multicolored Flyknit upper finished off with a ferocious lion graphic on the tongue. Releasing on MLK Day 2019, the Nike LeBron 16 ‘Equality Pack’ features two mismatched pairs dressed in black and white. Each pair boasts a translucent outsole with the word “Equality” done in black. These predominantly black basketball shoes feature red accents throughout. Other details include James’s signature on the tongue and a predatory lion head on the heel. This colorway represents the center position and is LeBron’s favorite. It is inspired by his children and the I Promise School he opened in Akron, Oh. 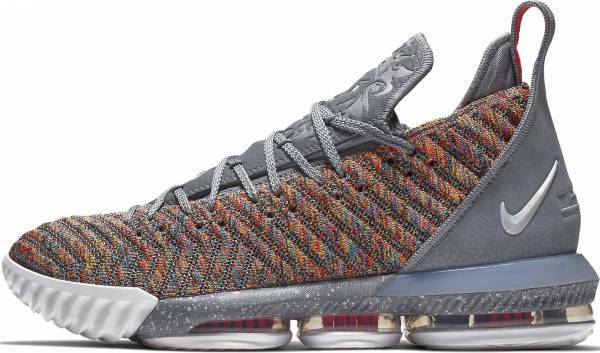 The Nike LeBron 16 ‘I Promise’ features a black-based upper that sits on top of a multicolored outsole. On the heel, the message “We Are Family” finishes off the theme. Part of the ‘1 thru 5’ collection, the ‘King’ colorway represents the small forward position. It is dressed in red and features a leopard print on the heel that is reminiscent of the Air Zoom Generation ad campaign. Metallic gold accents complete the silhouette. Paying homage to the favorite ‘Superman’ colorway of Nike LeBron 3 PE from 2005, the LeBron 16 SB ‘SuperBron’ features a white upper with patent leather overlays dipped in varsity royal. Yellow and varsity red accents complete the Man-of-Steel-inspired theme. This colorway is part of Nike’s #LeBronWatch series that pays tribute to iconic silhouettes and James’s favorite sneakers. After 15 seasons, LeBron James is still the King of the NBA. His values, hard work, and tireless effort have propelled him to the top. Inspired by his personal mantra, the Nike LeBron 16 ‘Strive for Greatness’ represents his family, his hometown, and his unwavering spirit.